In September this year we had the pleasure of communicating with the lovely Ruth from Ruth Crawley Beauty. Ruth had contacted us in regards to her existing website wasn’t performing well on the search engines. We took some time to review her situation and see how best we were able to assist her. We noted that although her site did have some optimisations in place it wasn’t drawing enough attention on the search such as Google & Bing. Evidence of this was shown when you couldn’t type in any of her service names followed by broader area locations for example the “Hunter Valley” or “Maitland” opposed to her actual suburb of her Beauty Studio Heddon Greta, Heddon Greta is only a short drive from Maitland or the Hunter Valley and Ruth’s business wasn’t coming up. We started working out the best way to improve the situation. We need to add more content connected to Ruth’s site that the search engines could explore that details more in regards to her services and also helped her strengthen her presence online. We decided to implement A BLOG, DEDICATED SERVICE pages and implement some SKYPE MENTORING & TRAINING. BLOG – short for Web Log – it’s like an online diary for your business. Whilst you don’t necessarily have to write your content from a personal “Dear Diary” type scenario. However due to the competitive nature of the beauty industry and the ability to add new content in the form of a blog post, targeted to the type of information that your prospective clients are going to want to read – answering questions they have and demonstrating your wealth of knowledge is truly valuable. Clients could then easily share that particular service around via the link or even just key in the search engine the name of a product or service and the service area for example if they were looking for Micro Skin Needling Hunter Valley or Microdermabrasion Maitland chances are these dedicated pages are more likely to show up. Although Ruth is only a short drive away from my office in Abermain, the convenient of being able to jump on an program on our computers or phones and have a quick chat, video call, share files and my favourite feature – share screen we’re able to do so much more. Share Screen allows you to connect with a Skype user and they allow you to view their screen or you can share yours. We used this amazing tool during training or to walk you through how to address an issue – ie completing a tasks you’ve not done before or solving problems that are coming up for you. It makes it 100% easier, more cost effective and the turn around time is cut down to a 1/4. Ie Ruth needed to know how to do a particular task or reiterate something we’d discussed in our last mentoring session, we quickly connected via Skype and I was able to walk her through the process. It’s pure genius! And I LOVE the feature. 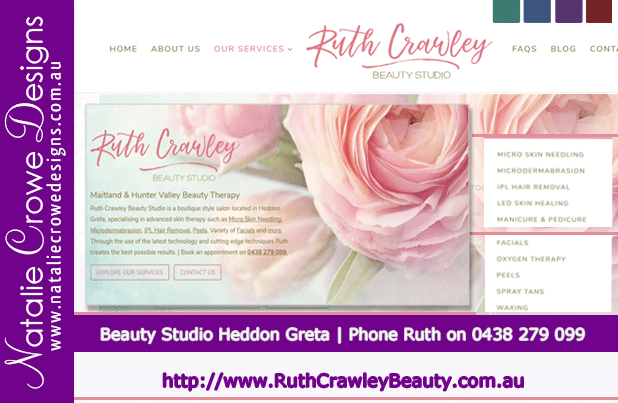 Ruth Crawley Beauty Studio provides professional beauty services for the Hunter Valley including Heddon Greta, Maitland, Cessnock and Kurri Kurri. Late appointments are available Tuesday and Thursday evenings. To all of our wordpress clients, WordPress has announced a security update advancing to WordPress version 4.2.1. If you are once of our ongoing maintenance client we initiate this update for you, and have your site updated as a part of the service. 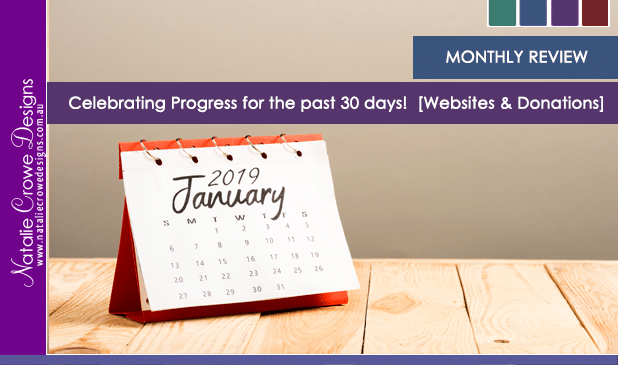 If you are not on our ongoing maintenance plan you can either look to complete the updates yourself or book in to have your website update by Natalie Crowe Designs. 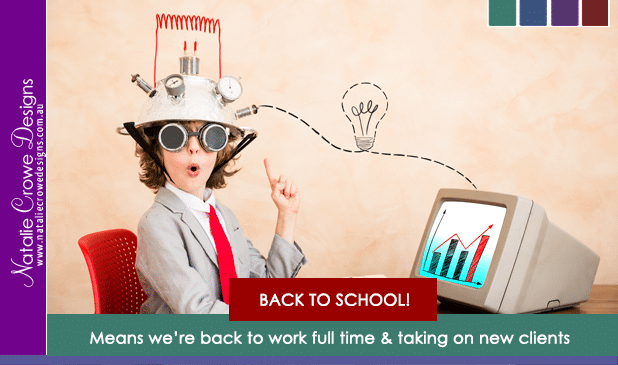 If you have any questions or would like to schedule your updates, please contact our office 0423 285233. 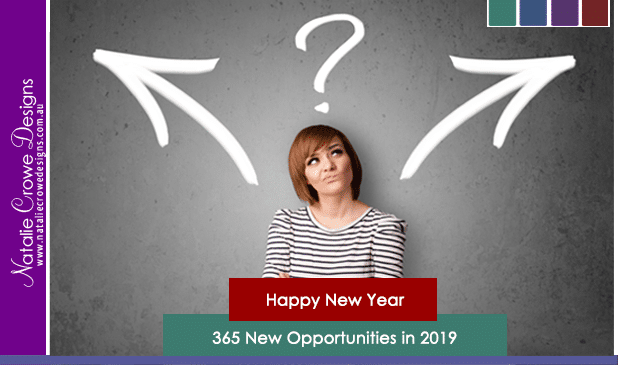 IMPORTANCE OF UPDATING YOUR WEBSITE! If you’re using a system that is open-source or that is free to use, it’s more important than ever to upgrade that system and keep your site up to date with the latest security, as that the source code is available to everyone and hacker use these type of systems in order to exploit people… Keeping in mind, there is always good and bad in every situation, as long as the appropriate security measures are taken, you can benefit greatly from content management systems such as WordPress, or Joomla etc, one these precautions have taken place..
Natalie Crowe Designs will be working closely with this client to get this website back on track, we’ve currently accumulated a whole day over the last 3-4 days, in addition to a midnight call out to address the emergency, all of this time has been spent trying to address the issue. And are now having to implement a clean version of the latest software and rebuilt the website system. If you find yourself in the same position or you have not updated your website for some time, get in contact with us so we can help you get your site up to date and also make sure it’s secure! It’s a loss of revenue, loss of business and damage to your reputation when it comes to issues with your system security and we’re here to help.